For all those birthdays or parties when you just need to throw some confetti. Mix all wet ingredients together then combine the dry and mix all together. Preheat oven to 350. Pour mix into 12 cupcake cups 3/4 of the way full then bake for 30-35 minutes. While they're baking make the confetti top. In a small pan place chopped almonds and agave nectar and toast for a minute. When cupcakes are done remove from cupcake pan to cool for a few minutes. 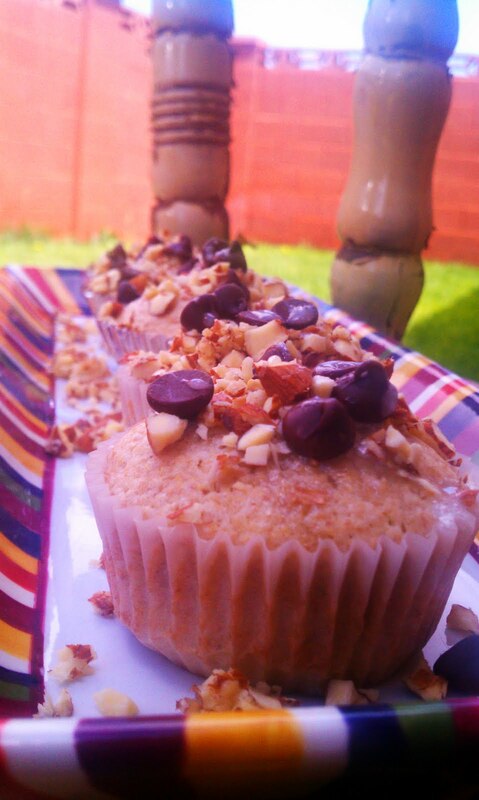 Drizzle a little glaze on tops of cupcakes so the almonds and chocolate chips have something to stick to. Top with your confetti concoction, then drizzle a little more glaze over top the almonds and chocolate chips. (If you eat them while they're still warm the chocolate chips are soft and slightly melted) So, so yummy! *Flaxseed is not only the highest plant derived source of omega 3 fatty acids and a great source of fiber, but can be substituted in place of butter, margarine, oil, and eggs. Here's a fun tip if you look at the shape of nuts like walnuts, what do they look like? A brain. Now look at an almond. It shares a vague resemblance to reproductive organs, like woman's ovaries. So guess what. Walnuts are great for your brain and almonds are great for...yep your reproductive organs. Kind of cool right? "Products which balance hormones [are] primrose oil, flaxseed oil, soya products...and nuts like walnuts, almonds...."